– the co-citations are… I have no idea? Other papers that have been cited by papers that cite the target paper? 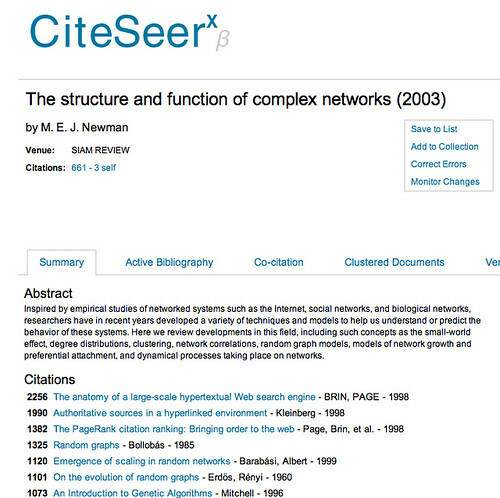 – Clustered Documents – these seem to be other Citeseer records relating to the same paper; do they all have the same citation info? I have no idea????? I’m guessing the dc:relation elements refer to the papers listed on the ‘front page’ of the results for a given paper, that is, they are the most heavily cited papers that cite the target paper? – what do the different results listings on the HTML pages actually refer to? – what do the results in the OAI query above relate to? – is it possible to get a list of all the paper that cite/reference a particular target article? Previous Previous post: What’s Inside a Book? Next Next post: Google Banner Ads as On-Campus Signage?